A GROUND-BREAKING Chinese artist will highlight her work in SL at the opening of her RL exhibition in New York this week. China Tracy, the avatar of Cao Fei who is renowned for using SL as the medium for her RL work, spoke exclusively to The AvaStar about her latest masterpiece, RMB City. It is described as a virtual China which combines communism, capitalism and Chinese mythology. It will be shown in the Lombard-Freid Projects gallery in Manhattan, opening this Friday. The AvaStar: How did you come up with the idea? China Tracey: I took half a year to adventure in SL, and finished a 28 minute-long SL documentary called ‘i. Mirror’. 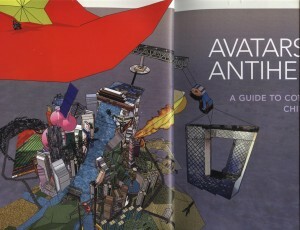 The film participated in The 2007 Venice Biennale and is now showing in New York. At the end of the Venice Biennale, I thought that maybe I could create a place that belonged to me within SL – my own city utopia. TA: What does the city represent to you? 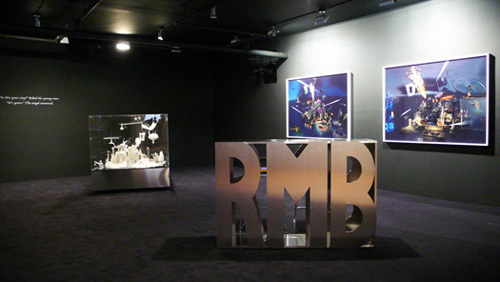 CT: RMB City (RMB refers to ‘renminbi’ or ‘people’s money’, China’s official currency) mixes the different elements of China. I’m very interested in the city as an organism and have done a lot of research on cities in China, and I’m hoping I can use my knowledge to build a Second Life version of my vision of the Chinese city today. All the cities currently in SL are Western-style, so Chinese users can’t find spaces that reflect their culture. SL is a big world, and you want to build something to locate your own identity. TA: What is the future of SL as an art medium? 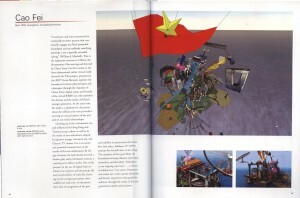 CT: SL is a good medium for art, also for architecture, fashion, business, neo-sociology research, communication. It’s such a big subject for different fields. Although I’m an artist, I hope my city will help build dialogue between different territories. Feb 29, 2008. P8, 20-23 and head page. “I construct, and I am constructed in a mutually recursive process that continually engages my fluid, permeable boundaries and my endlessly ramifying networks. I am a spatially extended cyborg” (William J.Mitchell). This is the impressive overture to I-Mirror, the documentary film starring and directed by China Tracy, Cao Fei’s avatar in the three-dimensional online virtual world Second Life. This project, presented at the 2007 Venice Biennale, explores the boundaries between physical space and cyberspace through the character of China Tracy, digital avatar and founder of the virtual RMB City, who embodies the dreams and the reality of China’s younger generation. At the same time, the work is a platform for discussion about the influence the virtual world is exerting on our perception of the real and on our social relationships. Growing up in the information era, and influenced by Hong Kong and Taiwanese pop culture as well ad by the world of new subcultures shaped by Japanese manga, America rap, and Chinese TV drama, Cao is an astute and powerful commentator on the trends of the new millennium. By the age of twenty she had already directed a therter play, and performance remains a central part in all her works. One of the pioneers in the use of digital video in China, Cao explored and documents the new social realities of daily life, focusing on the younger generation, their indifference and sense of alienation, their lack of recognition of the past and inabiility to project into the future. Her first video, Imbalance 257(1999) portrays her friends’ lives at art college. The narrative of this piece blurs the boundaries between illusion and reality, rationality and absurdity: “Imbalance is our ongoing experience… a disease of adolescence,” Cao states. Humorous and ironic, her works narrate dreamlike and bizarre experience that guide the audience through the realm of this new generation’s myths and anxieties.